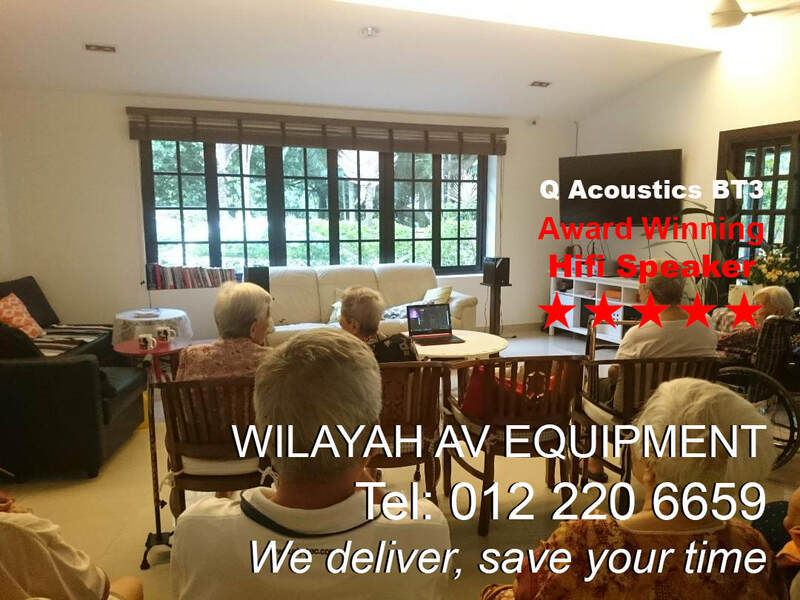 Popular Hi-fi sound systems in Malaysia - Wilayah AV Equipment, your home theater system and hifi sound system dealer in Malaysia. 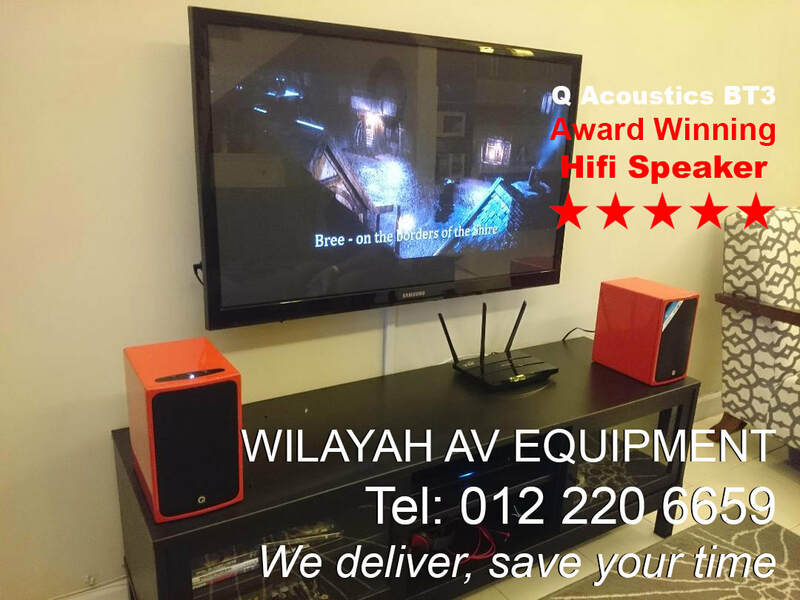 These are some of the popular and latest Hifi system and streaming system in Malaysia. Hybrid system being the top Hifi choice.With a hybrid amplifier, our customers get to enjoy high resolutions audio playback with laptops. 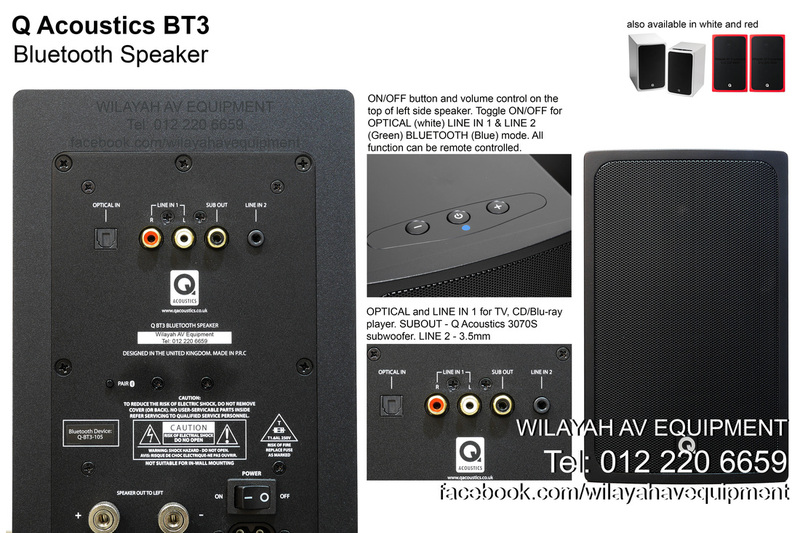 Q Acoustics BT3 is the best PC speakers for your music. Connect a Q Acoustics 3070S subwoofer to the Q Acoustics BT3 and you have a 2.1 channel for PC game and a home theater system! 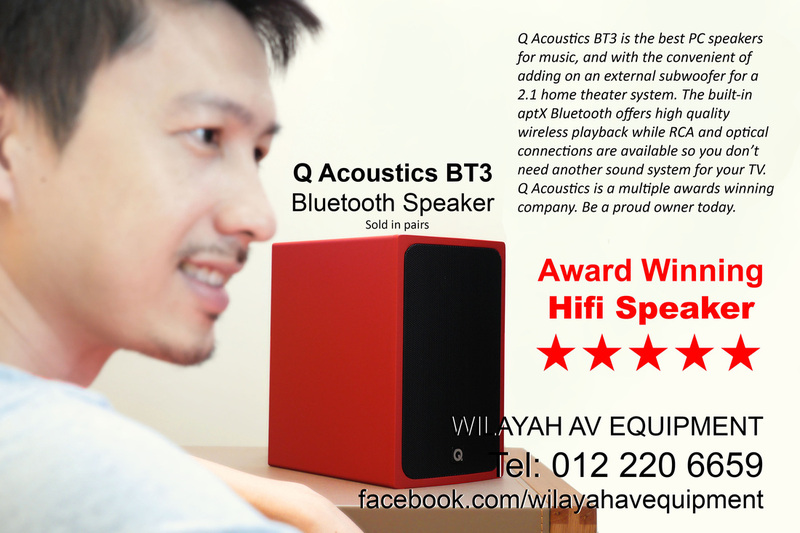 The Q Acoustics BT3 gives a hifi experience different from the usual PC speaker such as Edifier, Logitech and Altec Lansing or Sonic Gear. 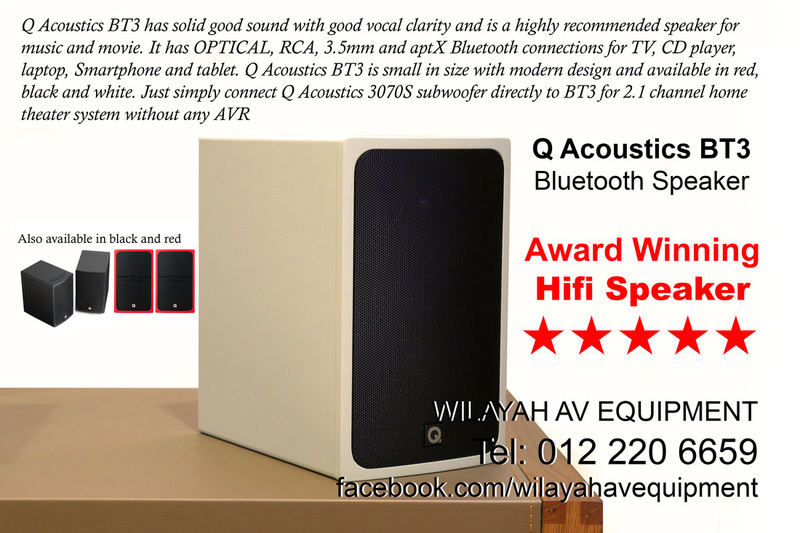 Q Acoustics BT3 comes available in Black, White & Red available at Wilayah AV Equipment (dealer). 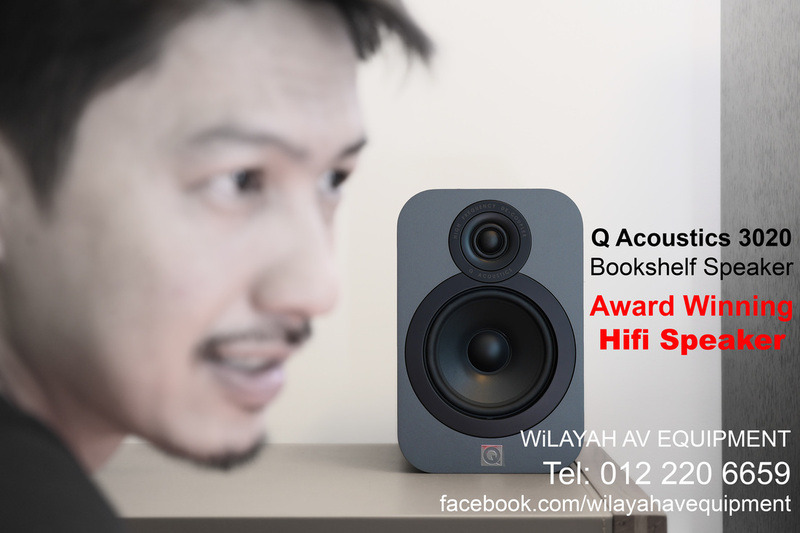 The Q Acoustics BT3 is an award winning hifi grade bookshelf active speaker. Just simply connect a 3.5mm cable from laptop or RCA from TV to the speaker and be amazed. Being a modern speaker, the Q Acoustics comes with built-in Bluetooth for user to play music wirelessly with Smartphones or tablet. 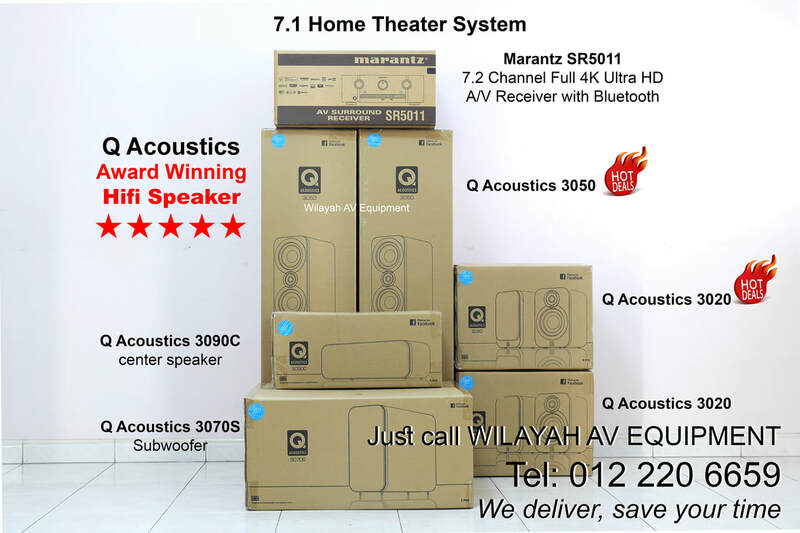 Connect a Q Acoustics 3070S subwoofer to the Q Acoustics BT3 and you have a 2.1 channel home theater system! 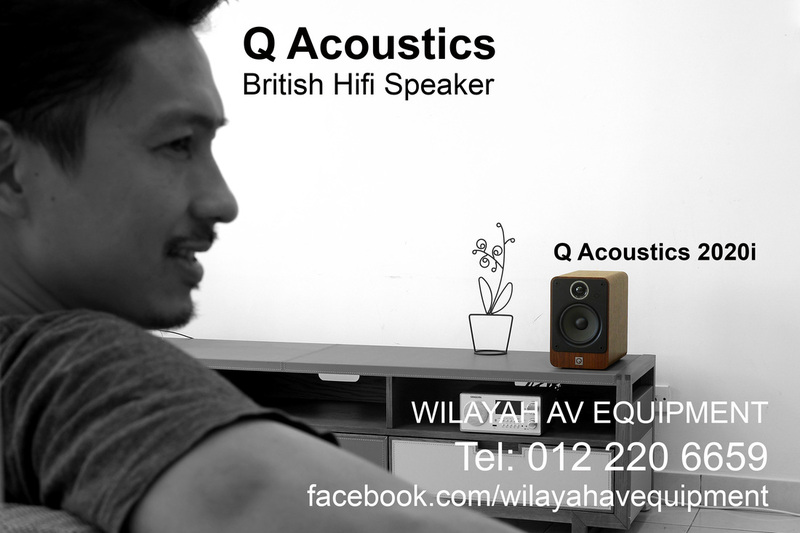 Q Acoustics BT3 has good sound and is a highly recommended speaker. Its for TV, laptop, Smartphone and tablet. It has aptX Bluetooth, RCA and optical connections. 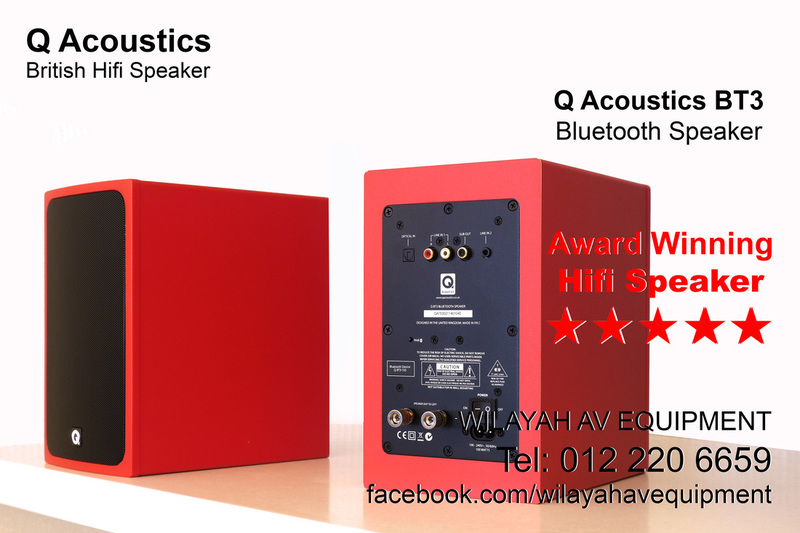 Q Acoustics BT3 is small and with modern design and available in red, black and white. It is expandable with Q Acoustics 3070S subwoofer to become 2.1 channel home theater system. In short, if you want to improve the sound of your TV and not a fan of Soundbar, Q Acoustics BT3 is an affordable solution. 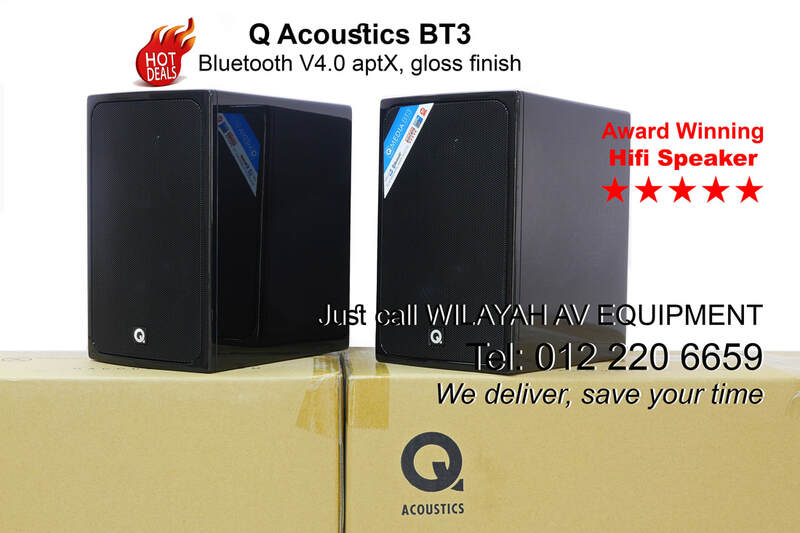 Q Acoustics BT3 is available for sale now. 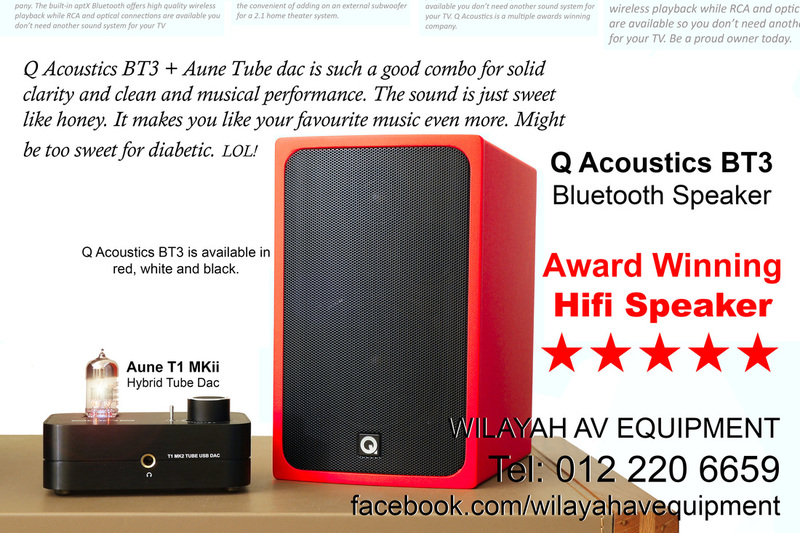 Q Acoustics BT3 and Aune tube dac combo for your PC and TV. Latest batch of Q Acoustics BT3 (August 2017) in gloss finish is such a beauty! 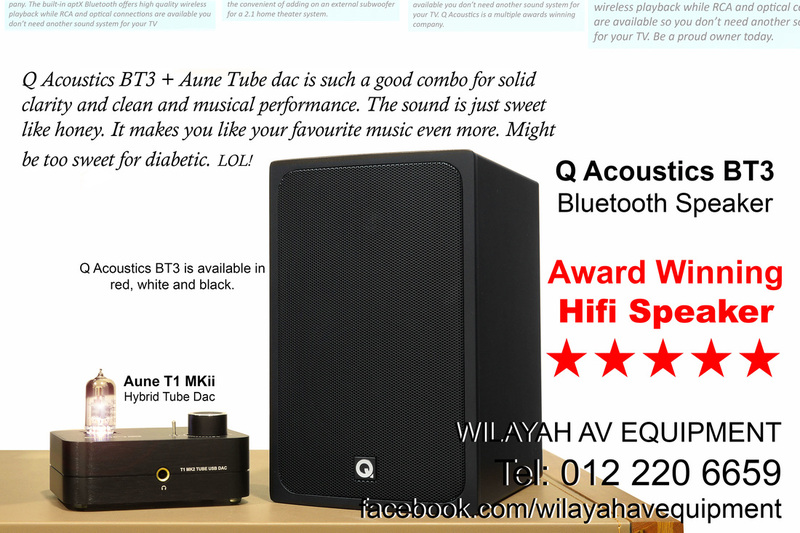 Q Acoustics BT3 is designed for clarity in mind, therefore it performs well for music and movie. Even at low volume, dialogs from movie reach listener's ears easily. Play your favourite jazz music and you'll start tapping feets. Be a proud owner soon. 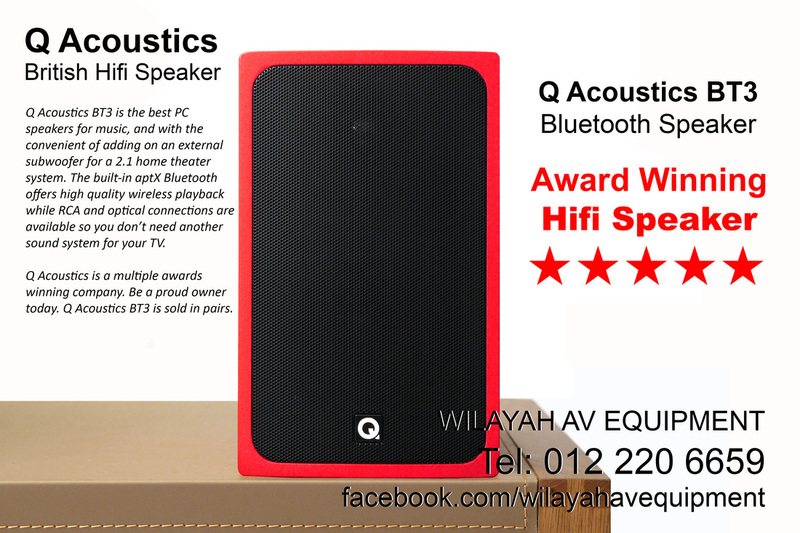 Q Acoustics BT3 is available in gloss black & gloss red. We are having a promo price while stock last. 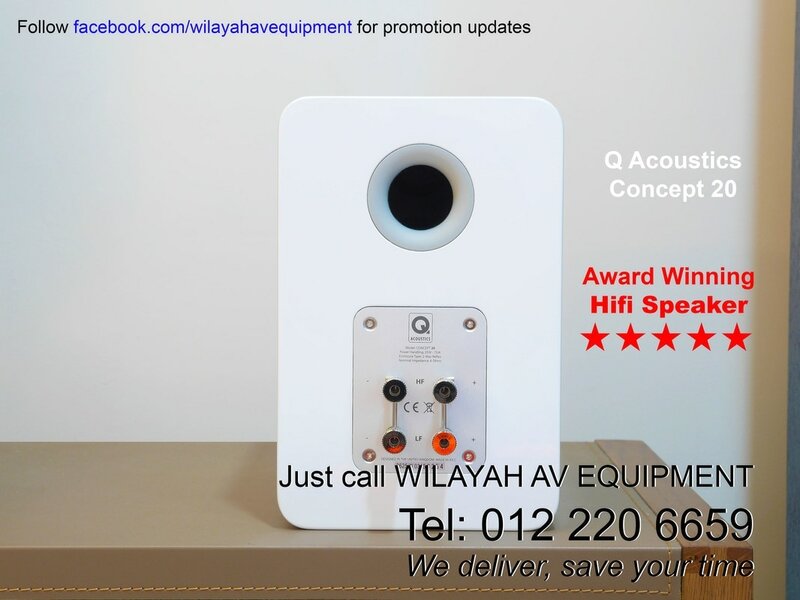 Award winning hifi speaker Q Acoustics 2020i at Wilayah AV Equipment in Malaysia. This bookshelf speaker comes in walnut finish or matte graphite. Q Acoustics 2020i with its contemporary looks blends in well while not too big in size and it sounds good and it is affordable. Comes in matte graphite colour too. This is a sound system that will compliment your interior design. Q Acoustics 2020i with Oppo 105D and Marantz SR6010. 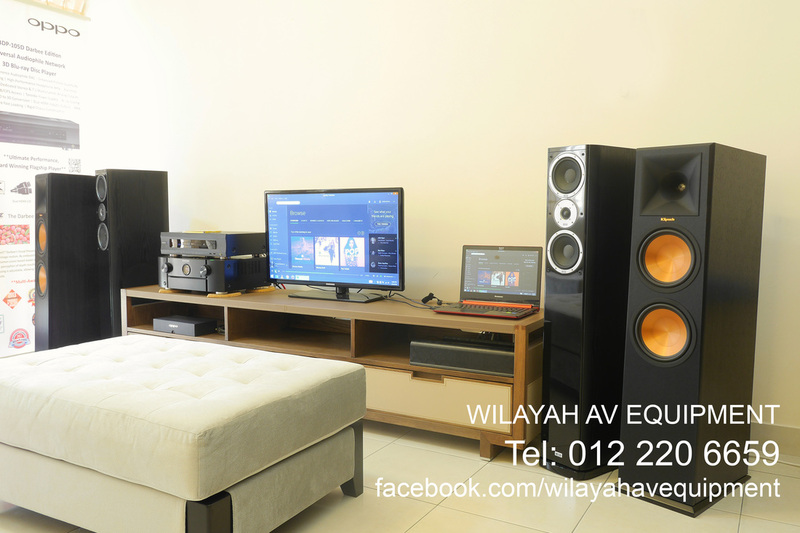 Other combinations include Q Acoustics 3020 + Oppo 103D + Denon AVR-X3200W or Q Acoustics 3050 + Oppo 103D + Denon AVR-X3200W. 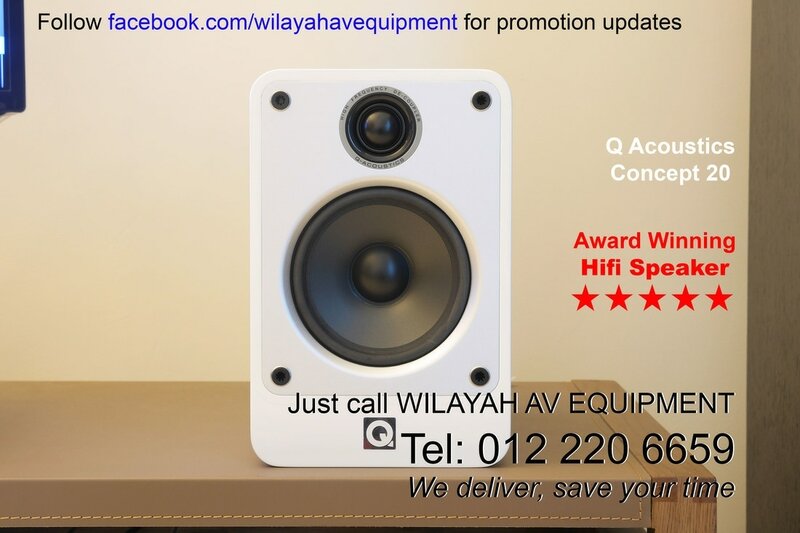 These are popular sound system in Malaysia. 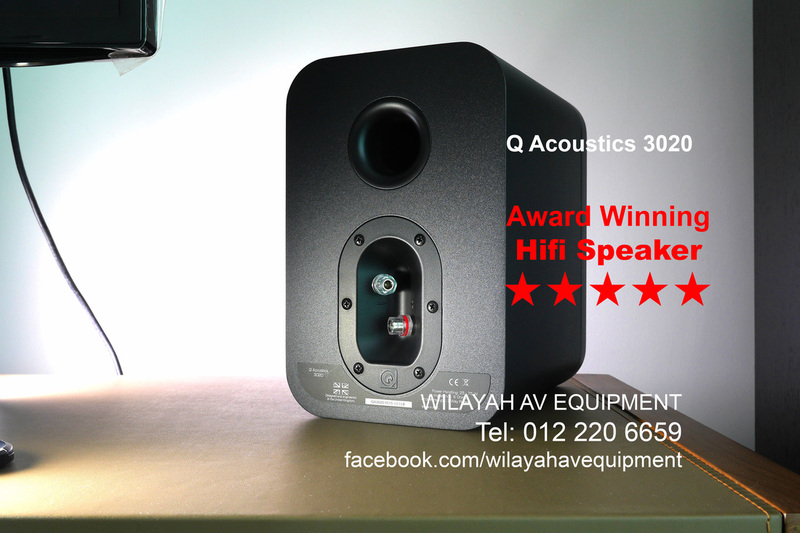 After the successful debut and worldwide sale of the Q Acoustics 2020i, came the Q Acoustics 3020. The Q Acoustics 3020 hifi speakers deliver a wide, deep soundstage populated by nicely layered and precisely focused instruments. We’re impressed by the dynamics on offer, as the 3020s deliver the music’s crescendos with confidence, while rendering low-level subtleties with a skill quite outside the scope of most rivals. 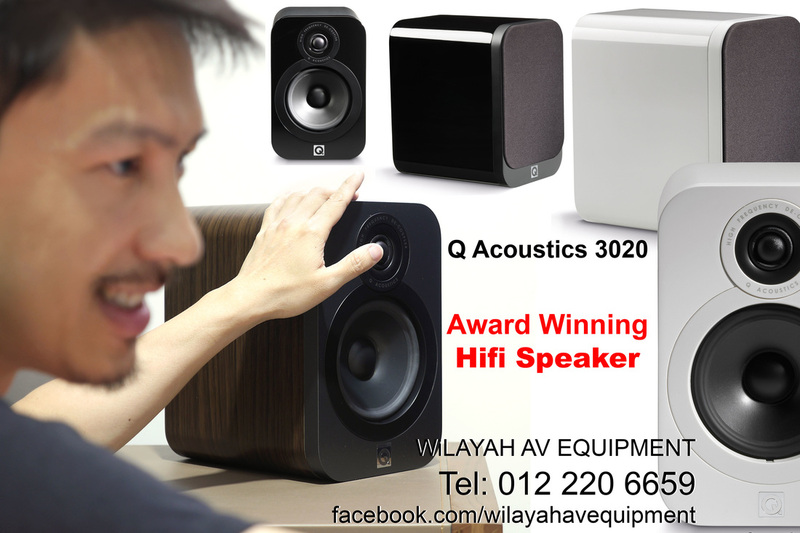 The Q Acoustics 3020 speakers will give you a quality of sound that’s well beyond the typical expectations of a below RM2000. 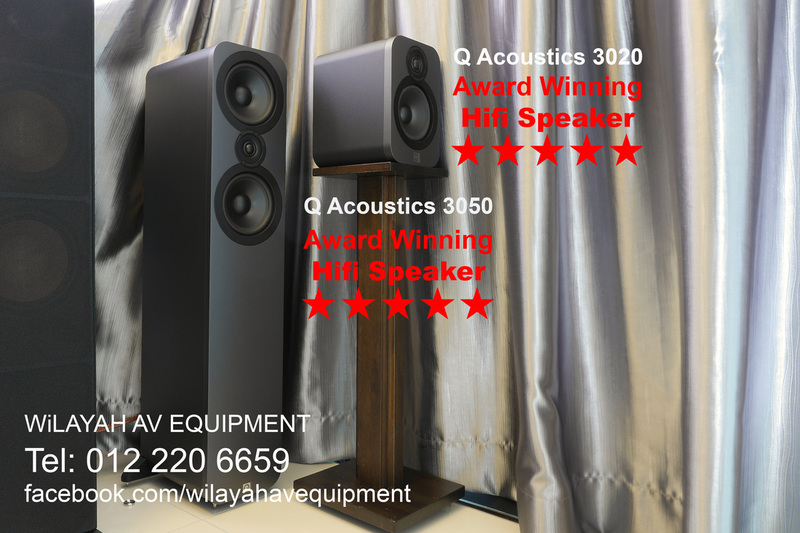 Is the Q Acoustics 3020 a fabulous value? Without a doubt. 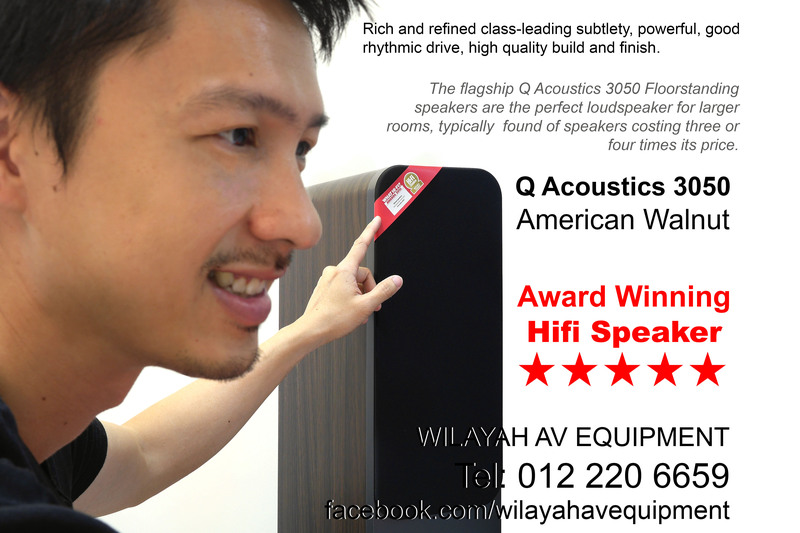 After clocking 100 hours on the Q Acoustics 3020 hifi speakers, we gave it a go at high volume. For a speaker this size, this price ... WOW! wow! WOW! It filled the hall easily. The sound can easily fool anyone thinking it is coming from any of the floorstanders next to it. The mids & high sounded wide, with details yet smooth. Even at lower volume, it sounded musical & lively, but bass thumping when the volume is high. We love to play it loud! Love it! The modern classic contemporary design hifi speakers are eye catching with a touch of elegance will win the approval of your spouse easily. What Hi-fi rated 5 stars. We agree. Q Acoustics 3020 hifi speaker in matte graphite colour looking sharp and cool and will blend well with a modern sound system. 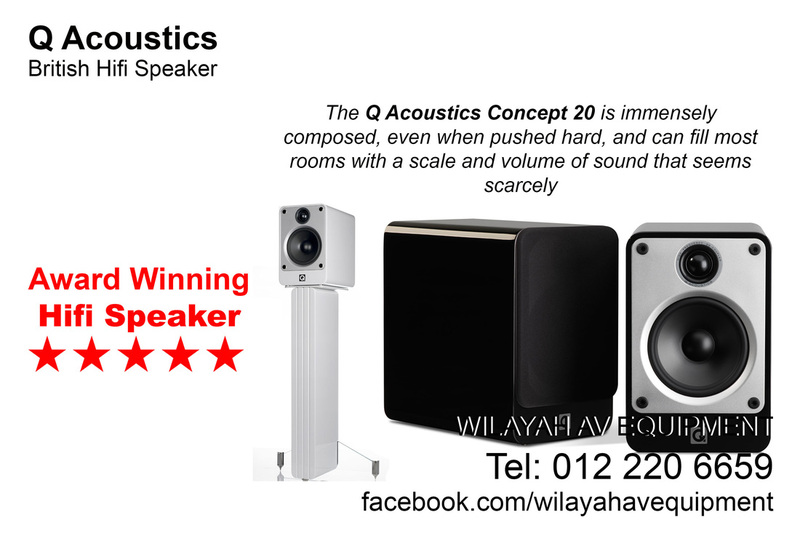 The Q Acoustics 3020 hifi bookshelf speaker sounds good, looks good and is good value for money. Is Q Acoustics 3020 the best hifi bookshelf speaker? 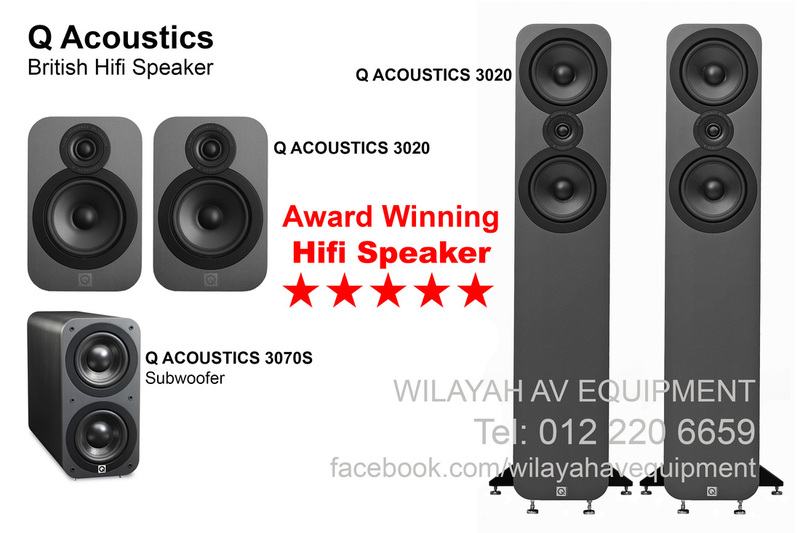 Q Acoustics 3020 is among the best affordable hifi bookshelf speaker. The Q Acoustics 3020 hifi speaker is also an ideal choice for small home theater setup. It’s for sale now, make a purchase and have it delivered to you. We deliver nationwide. Back view of Q Acoustics 3020 matte graphite. Also in the Q Acoustics 3000 series lineup is the Q Acoustics 3010. Its their most compact bookshelf speaker to date. 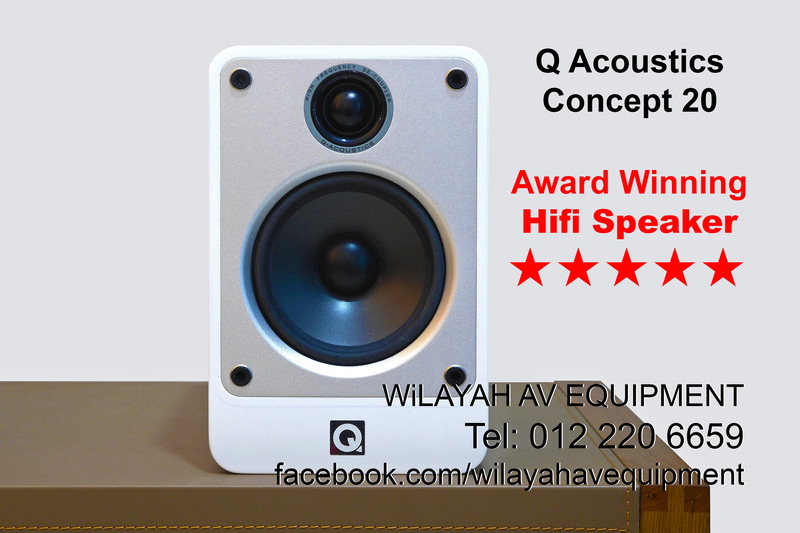 Q Acoustics Concept 20 is a highly recommended top of the line bookshelf speaker from the manufacturer. 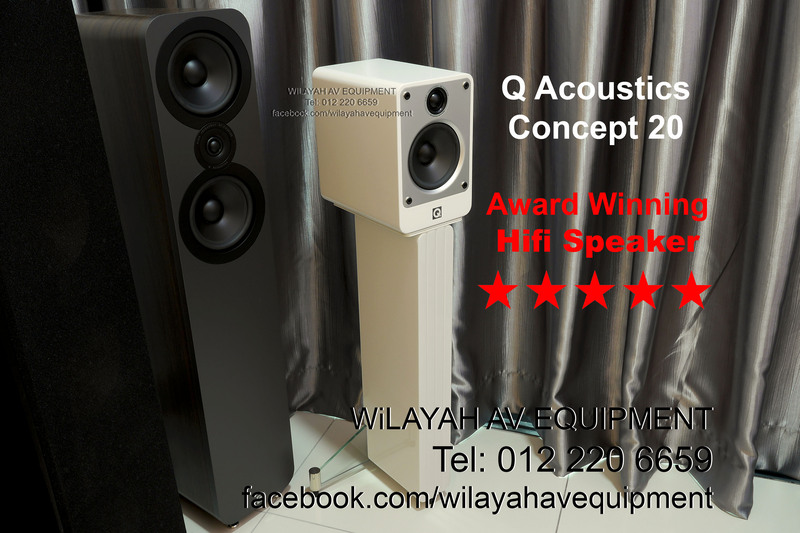 Q Acoustics Concept 20 is available for sale now, kindly contact 012 220 6659 for more details. Q Acoustics Concept 20 is available for sale. Kindly contact 012 220 6659 for more details. We deliver nationwide. 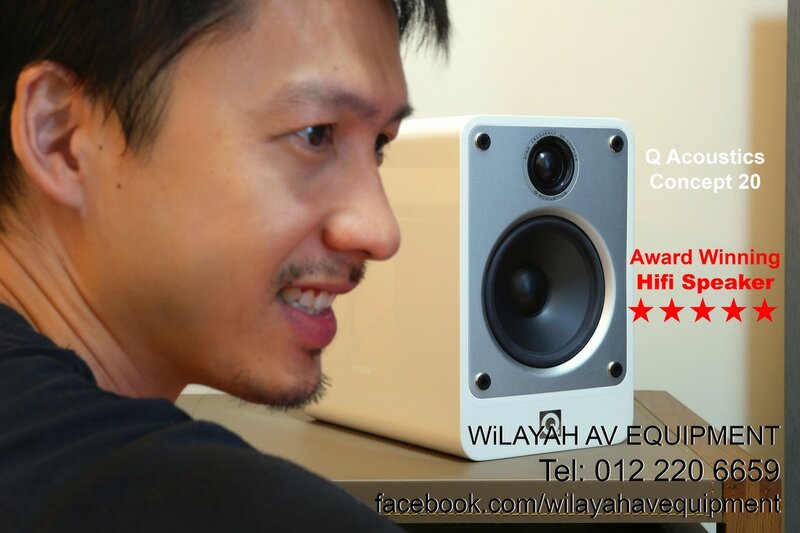 Award winning Q Concept 40 hifi speaker. This Q Acoustics Concept 20 is an award winning bookshelf speaker which is immensely composed, even when pushed hard, and can fill most rooms with a scale and volume of sound that seems scarcely credible from such a small cabinet. impressive clarity, seamless presentation pleasing refinement excellent build and finish. 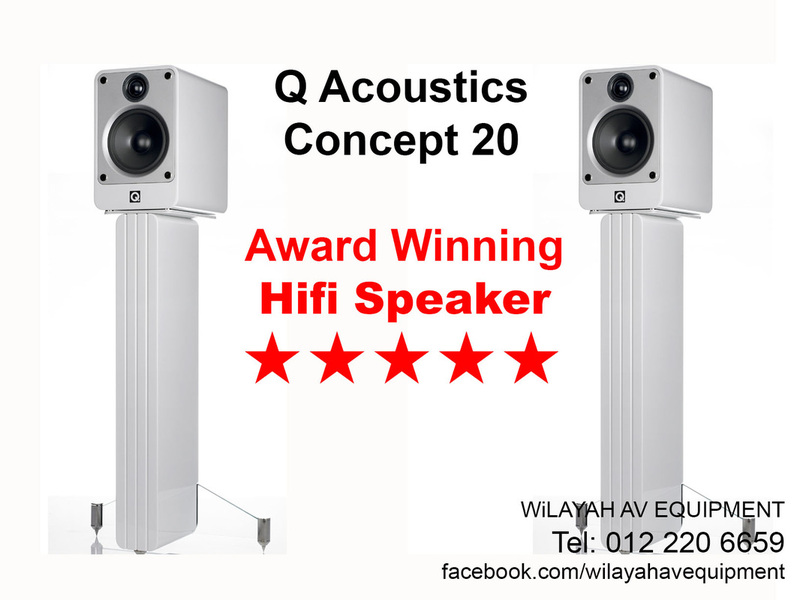 The immaculate and superb Q Acoustics Concept 20 bookshelf hifi speaker. Available in gloss white and gloss black. Heco Music Style 200 bookshelf speaker. The beautiful glossy piano finished Heco Music Style 800 floorstand speaker and Heco Music Style 200 bookshelf speaker. 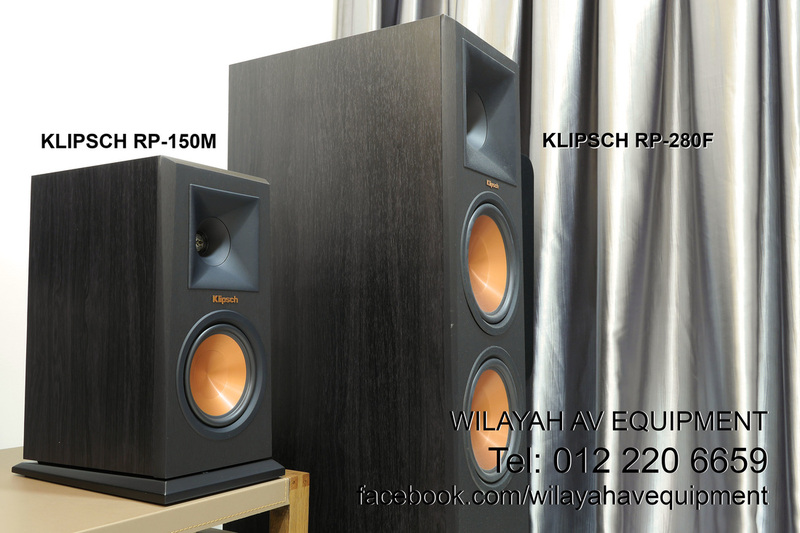 Klipsch R-15PM and Klipsch R-115SW for a heavy bass combo. The Q Acoustics 3050 is the flagship floorstand speaker in the 3000 series. 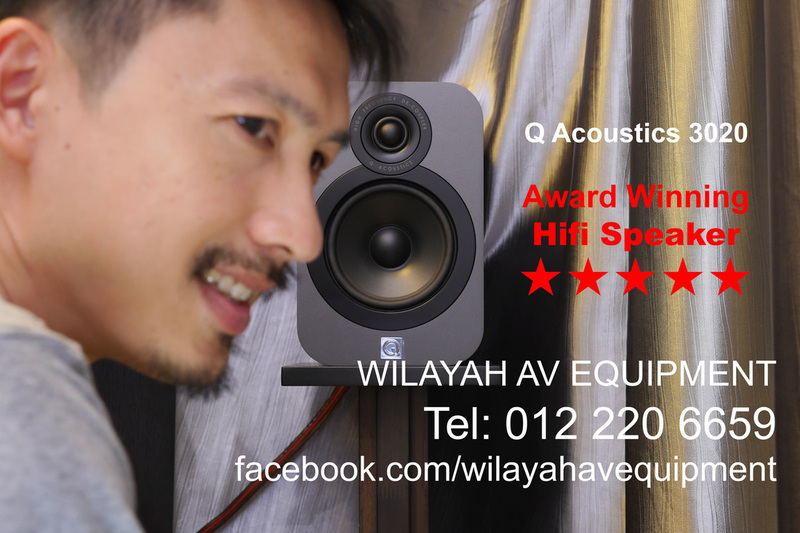 It is about the same dimension as Q Acoustics 2050i and with a whole lot of improvements. 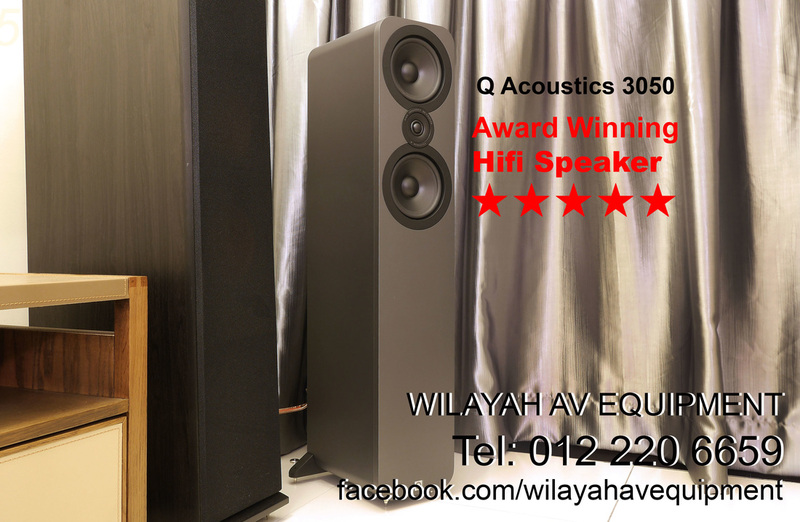 Right out of the box, the Q Acoustics 3050 sounds good, its neutral and warm compared to any Klipsch. Once the speaker runs-in, these floorstand speakers sing! and does it so well. Above the Q Acoustics 3050, there is a Q Acoustics Concept 40. Q Acoustics 3050 floorstand speaker. Popular top ranking recommended hifi sound system. Q Acoustics 3020 (top) and Q Acoustics 3070S subwoofer for a 2.1 hifi sound system. This system is good as a home theater setup too. 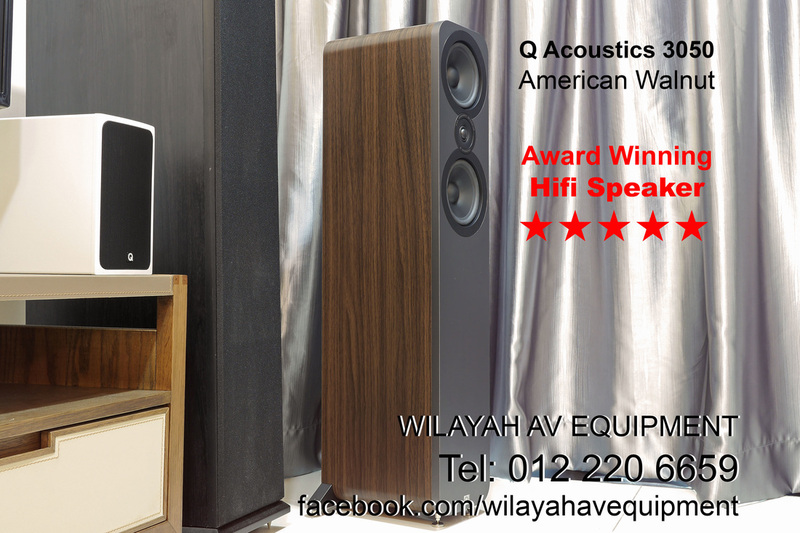 Q Acoustics 3050 walnut is available for sale. The 4.0 floorstands hifi sound system consisting of Klipsch RP-280F, Q Acoustics 3050, Oppo 105D and Marantz. It is good for music and movie. HECO Music Style 800 is an elegant and slim floorstanding speaker, which is equipped with a tweeter, two 125 mm midrange chassis and a 210 mm subwoofer that is integrated at the side of the unit. The HECO long-fibre kraft paper cone used for the woofer and midrange is driven by an ample ferrite magnet in conjunction with a high-performance voice coil to deliver a very balanced sound pattern with a tremendous degree of pulse fidelity. An extremely lightweight silk compound dome tweeter caters for a transparent implementation of the frequencies in the treble range. The models in the series skillfully combine different surfaces consisting of high-gloss and decorative veneers to turn a perfectly coordinated HECO speaker into a fine piece of furniture. The beautiful glossy piano finished Heco Music Style 800. 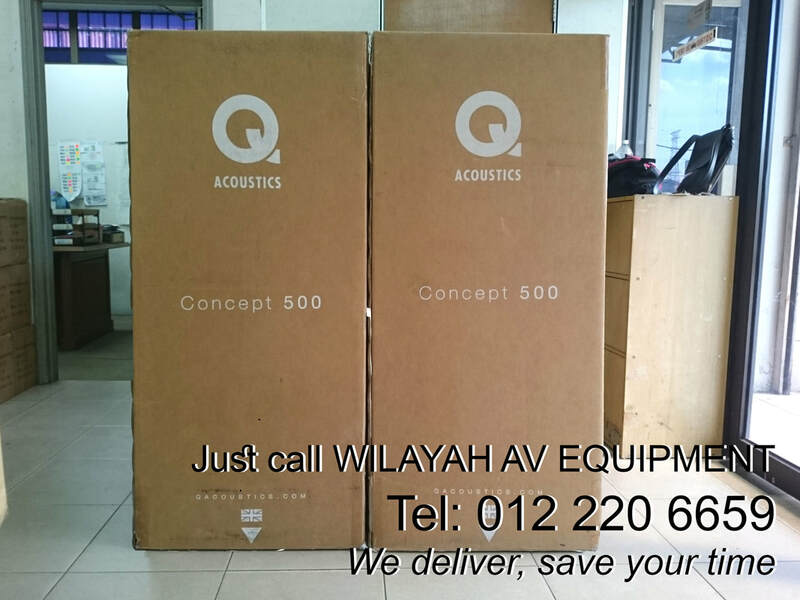 Q Acoustics 3020 and Q Acoustics 3070S subwoofer combo for 2.1 hifi speaker system. Q Acoustics 3070S with dual woofers is a "tall" design subwoofer ideal for small space. Q Acoustics 3070S subwoofer is recommended for used in most home theater systems, and can also radically improve the sound of stereo systems. The Q Acoustics 3070S subwoofer can provide a foundation to the sound that few speakers can muster on their own. 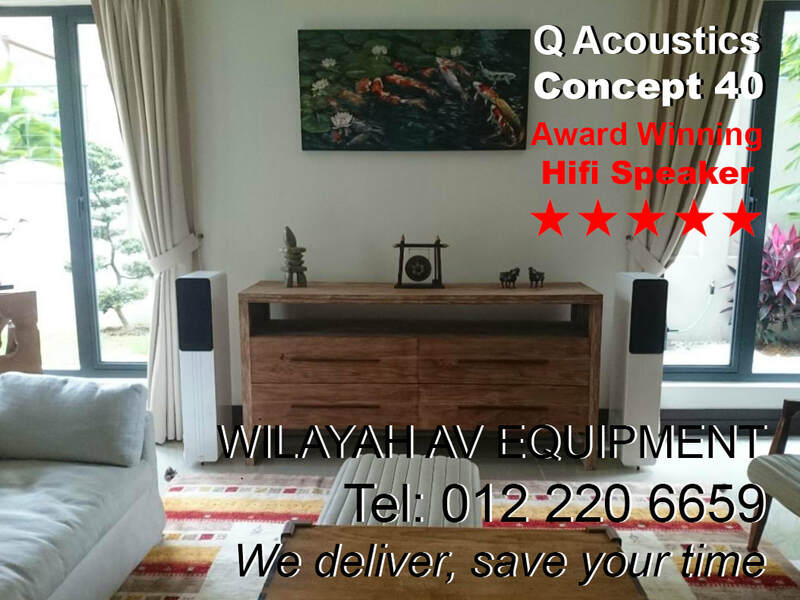 So adding a Q Acoustics subwoofer is not just about adding more and deeper bass, rather, a properly integrated subwoofer can improve the overall sound of the system. The unmistakably Klipsch R-112SW subwoofer (12 inches) will make bronze your new favourite color. 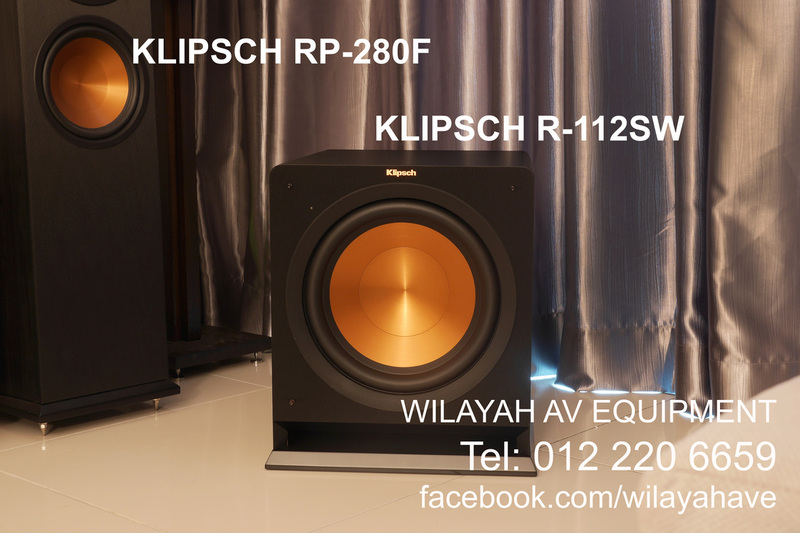 One cannot missed the Klipsch RP-280F floorstand speaker and Klipsch R-112SW subwoofer with its signature bronze color woofers. Its recogniziable even from distants of satellite in outer space. Just kidding. It is very distinguishable. The bass is deep, clean and tight. 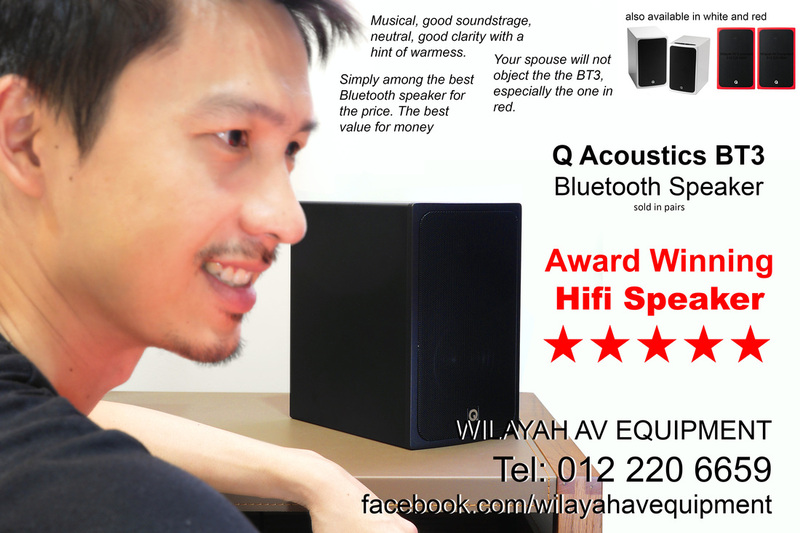 It is a must for your hifi sound system and home theater system. 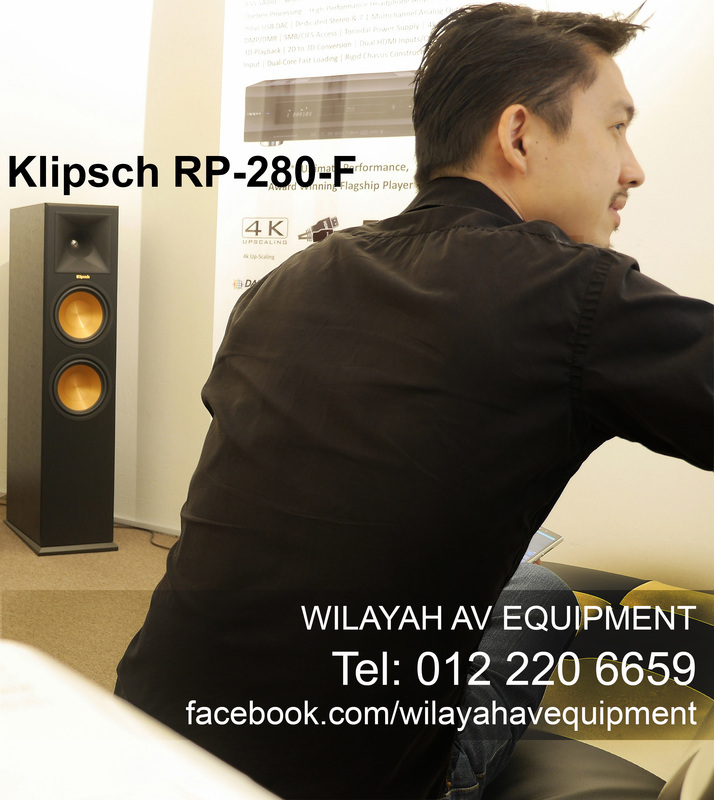 Newly designed Klipsch RP-280F is a versatile all rounder speaker that also excel as a pair of hifi speaker for music. 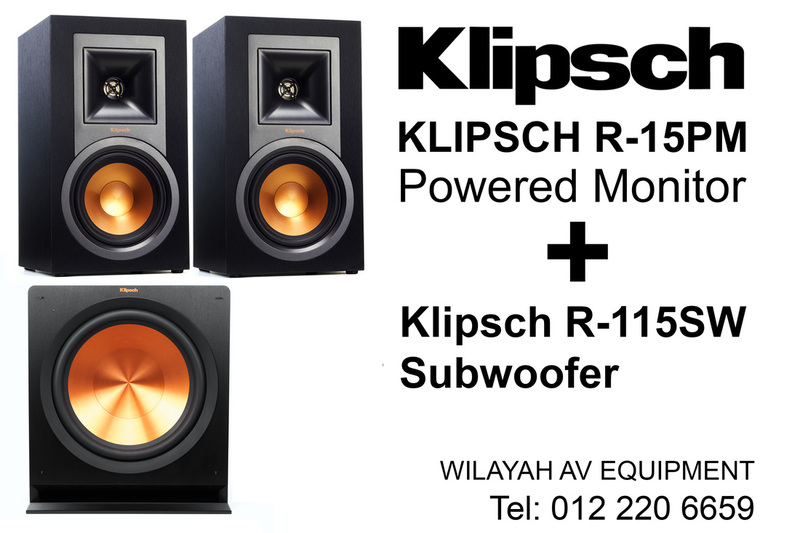 Pair it with Klipsch R-115SW for superb heavy bass. Hifi grade Klipsch R-15PM active bookself speaker and Aune T1Se Tube DAC combo (optional). 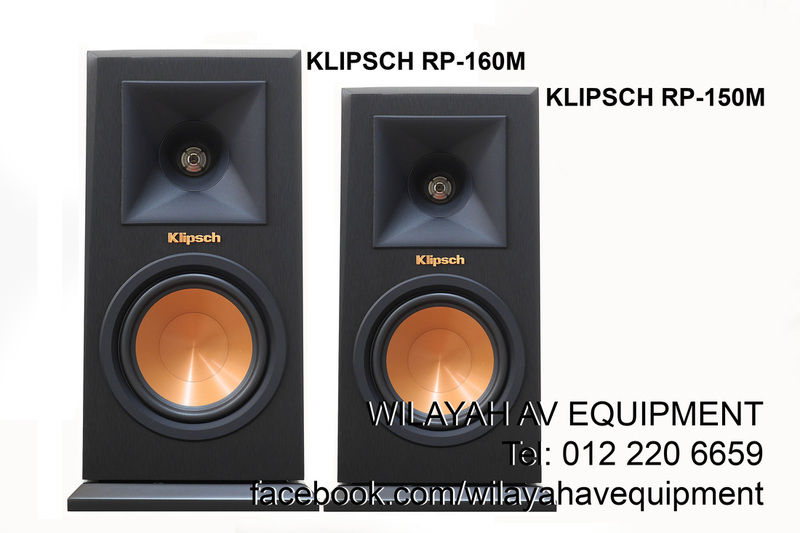 Klipsch R-15PM is an active speaker which connects directly to a computer or to a DAC. Connect the Denon to a computer and stream your favourite movies and music effortlessly. The Q Acoustics 3020 bookshelf speakers offer exceptional combination of refinement, insight and dynamics, terrific build and finish unfussy nature. 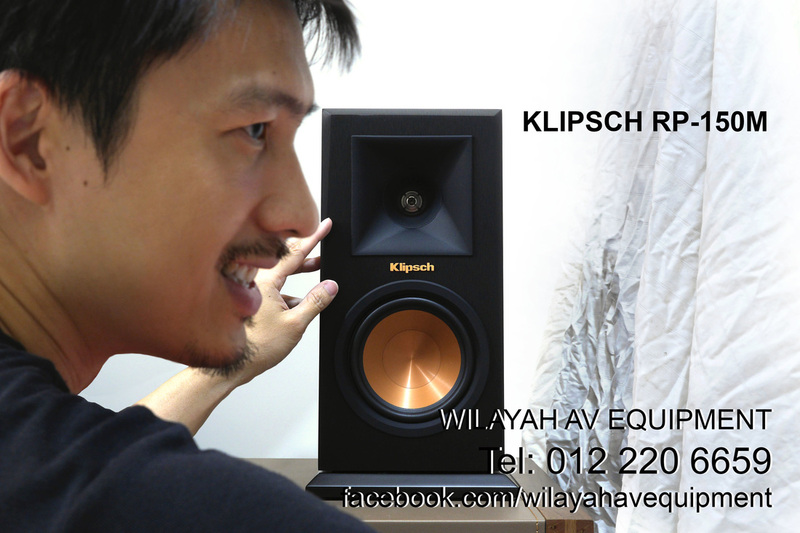 Best stereo speaker under RM1500. Denon AVR-X1200W with Q Acoustics 3020. 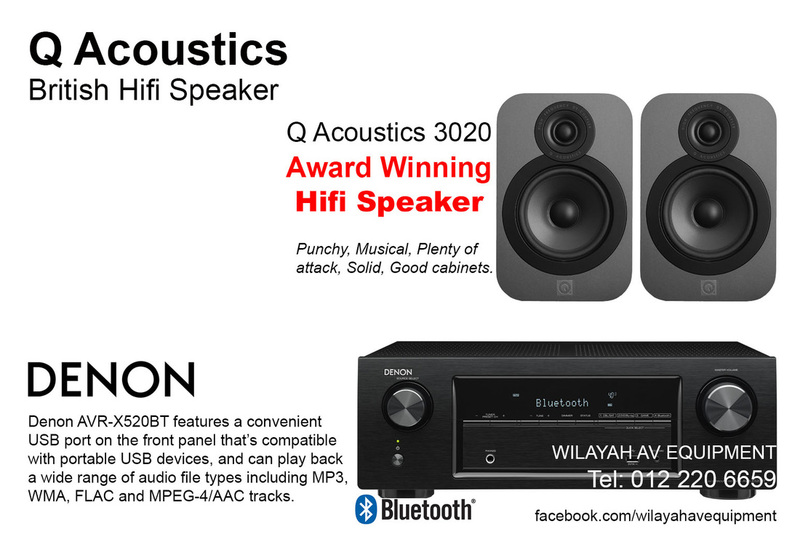 Hifi speaker Q Acoustics 3050 and Denon AVR-X3200W are popular sound system in Malaysia and its available at Wilayah AV Equipment. Separating from the usual home theatre system setup, Magnat’s hybrid amplifier is a good option for stereo hifi system. Magnat MA400 is the entry level hybrid amplifier with low distortions 40 watt per channel while the next rank up is the Magnat MA600 with 70 watt per channel. The Magnat MA600 is equipped with USB connection too. Both models come with preselected ECC 88 tube has been burned-in for 60 hours to ensure maximum signal stability in the high quality tube socket. 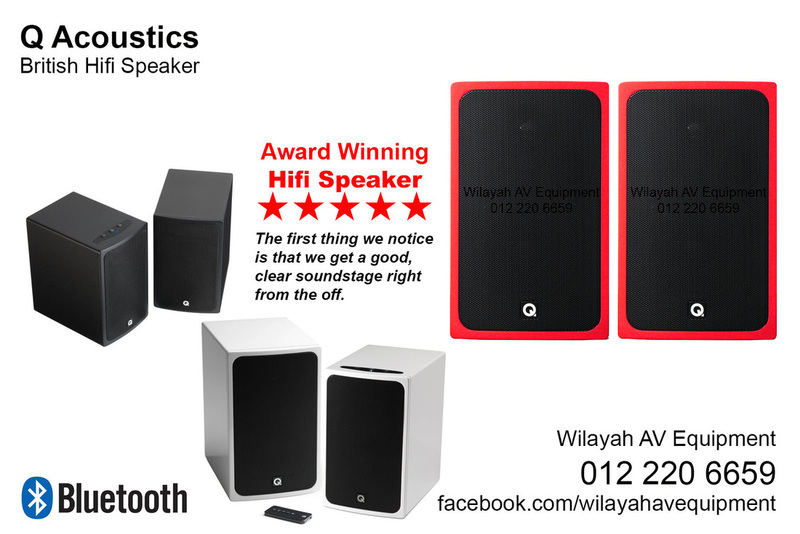 We recommend pairing Q Acoustics hifi speakers with Magnat amplifiers. Magnat MA600, a hybrid package that is unrivaled. With the MA 600, Magnat is addressingboth the young vintage fan as well as the music listener with a digitally-based media collection. Behind the "porthole" there is also an ECC88 preamp tube,which has already undergone 60 hours of burn-in time when the unit is purchased: a service from the Pulheim-based companythat should not be underestimated. Q Acoustics 3020 and Magnat MA400. Magnat MA400 is a hybrid amplifier with 40 watt per channel. 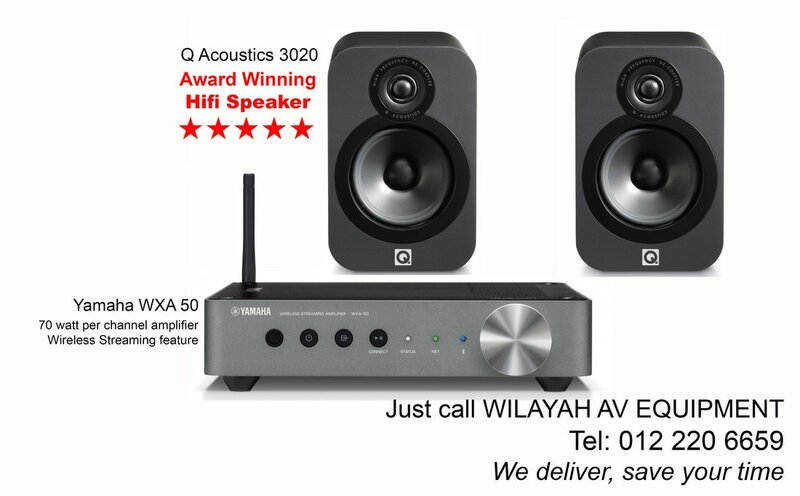 This is a recommended sound system for a room or medium hall. 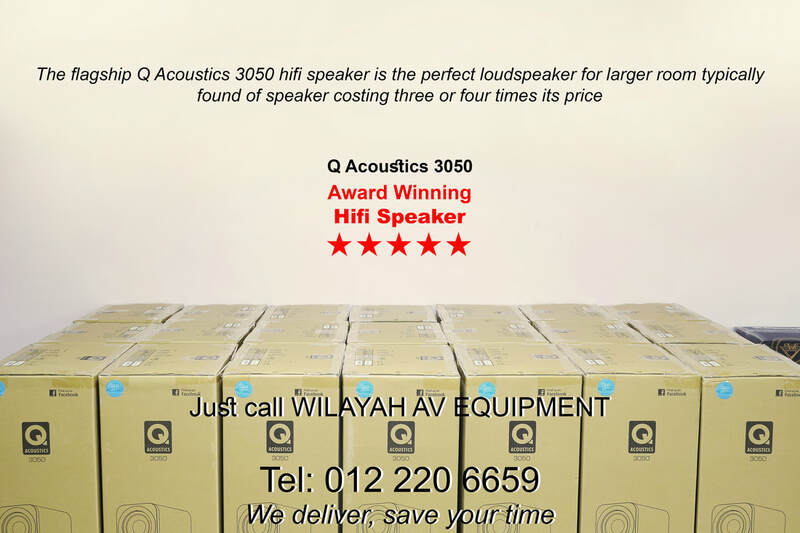 Q Acoustics 3050 waiting to be delivered to our customers during our promotion campaign. To make a purchase, just call 012 220 6659, we deliver, save your time. 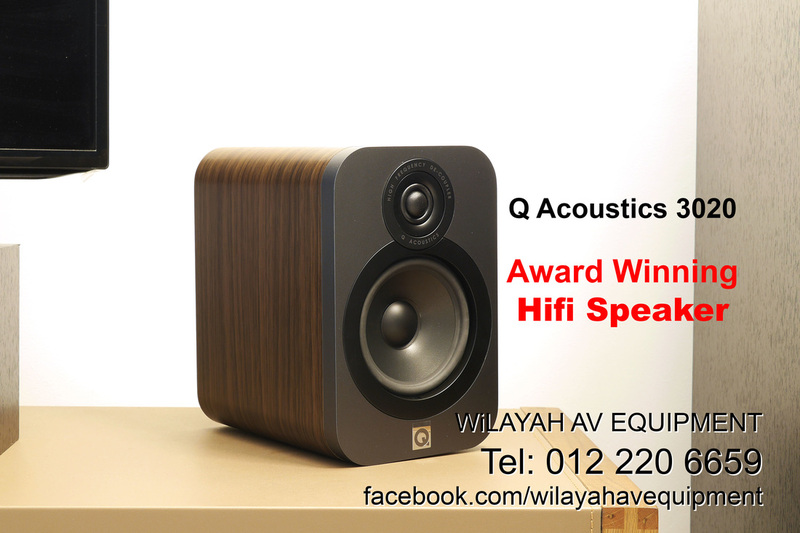 The award winning Q Acoustics 3020 matte graphite and Q Acoustics 3020 walnut to be delivered to our customers. To make a purchase, just call 012 220 6659, we deliver, save your time. 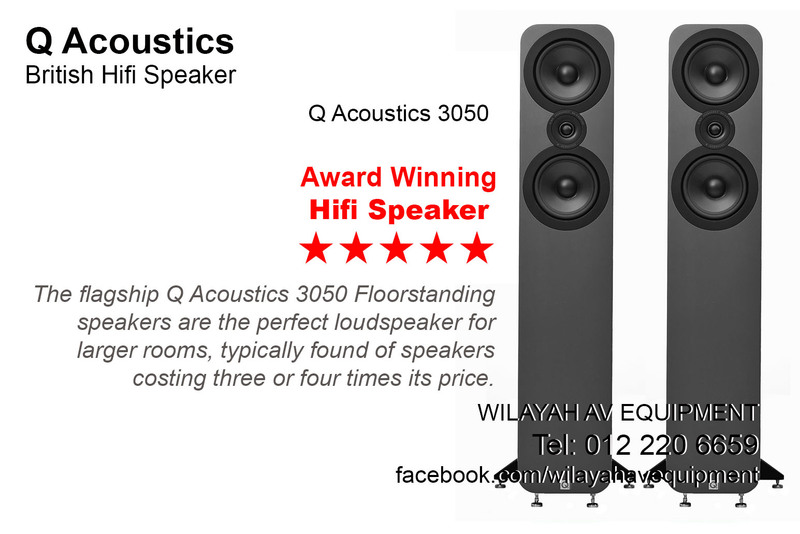 Q Acoustics Q3000 5.1 home theater speakers are available for sale now. Kindly contact 012 220 6659, we deliver, save your time. Q Acoustics 7.1 home theater system. For more details or to make a purchase, kindly call 012 220 6659. We deliver to you, save your time. Marantz SR6012. For more details or to make a purchase, kindly call 012 220 6659. If you are looking for an affordable hifi grade stereo amplifier, then consider the Marantz PM5005. 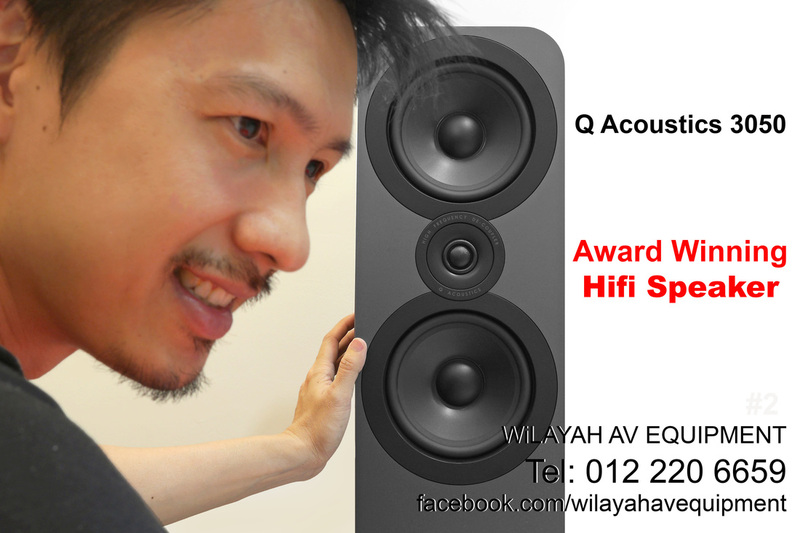 This amplifier with Q Acoustics 3020 is a good combination. There is also Marantz PM6006 with USB input for connecting to laptop for music playback. 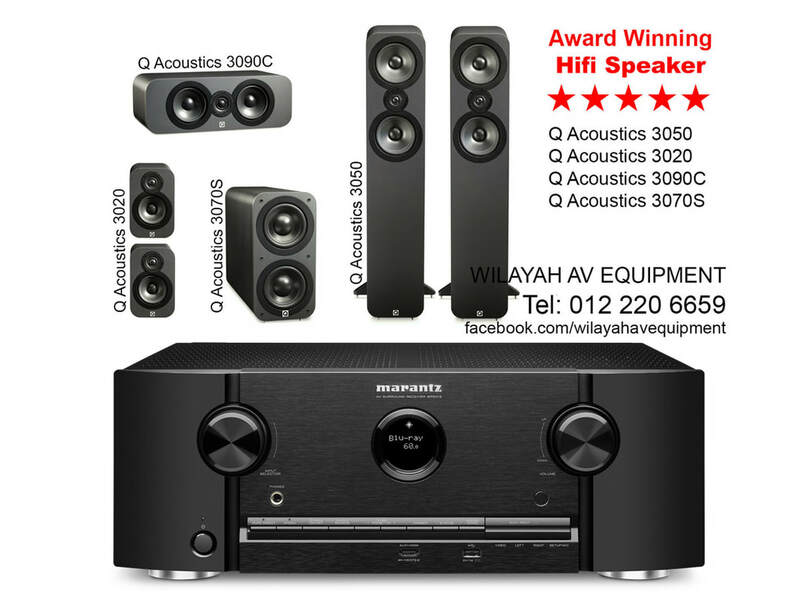 Marantz PM5005 + Q Acoustics 3020 hifi sound system combination. 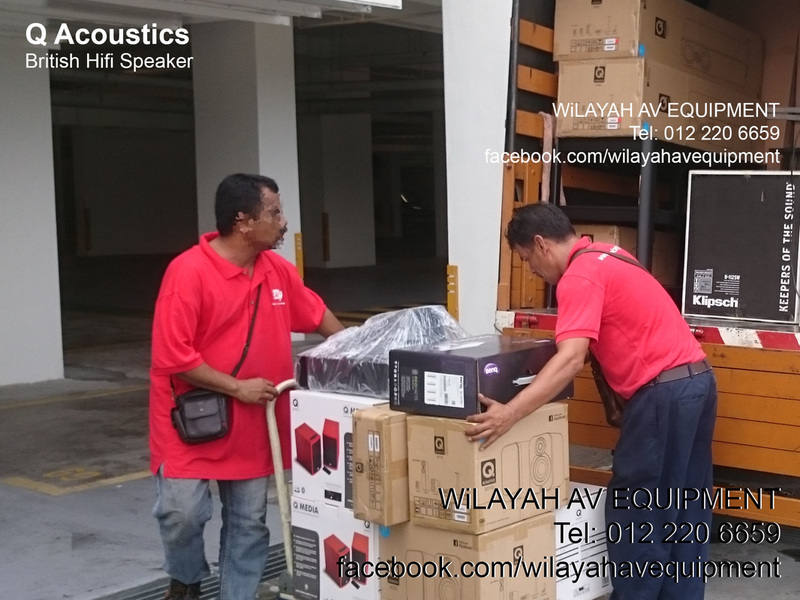 Delivering the Marantz + Q Acoustics to our customer. For more details, kindly call 012 220 6659. We deliver to you, save your time. 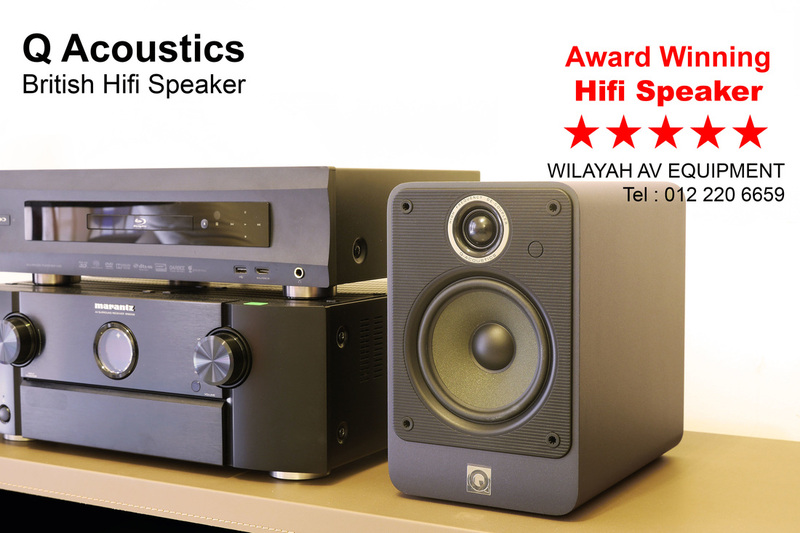 Q Acoustics 3020 + Marantz PM6006 hifi sound system for an impressive, smooth, balanced and insightful delivery. Q Acoustics + Marantz is a popular combination worldwide. A last look at the Marantz PM6006 before being delivered to our customer. Marantz PM7005 amplifier for higher grade of speaker. Denon AVR-X3300 + Q Acoustics home theater system. Denon AVR-X3300W, 7.2 Channel Full 4K Ultra HD AV Receiver with built-in Wi-Fi and Bluetooth®, Dolby Atmos, DTS:X, HDCP2.2, HDR, Audyssey MultEQ XT32, 8/2 HDMI In/Out. Rated at 105 watt per channel. 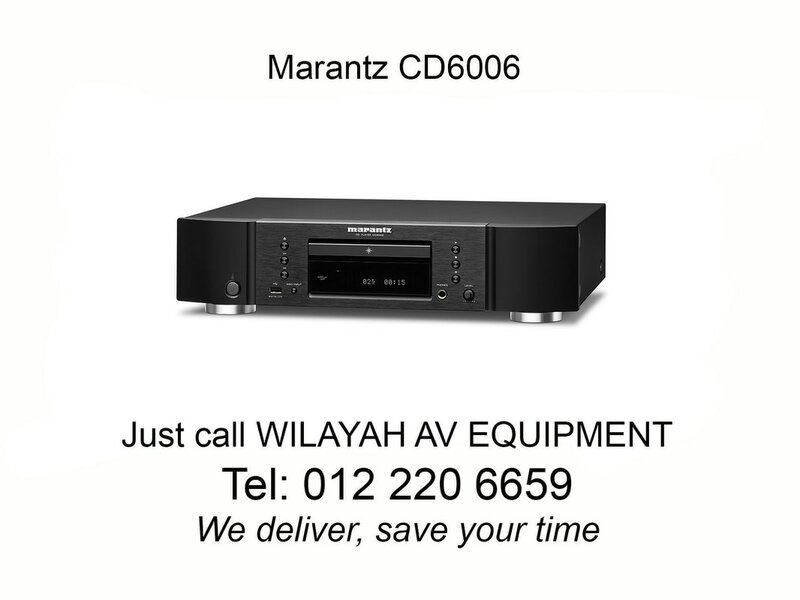 Marantz CD6006 features high resolution D/A conversion and is equipped with the reference class CS4398 D/A converter, which provides up to 192 kHz/24 bit resolution for optimum fidelity with high resolution audio file types. 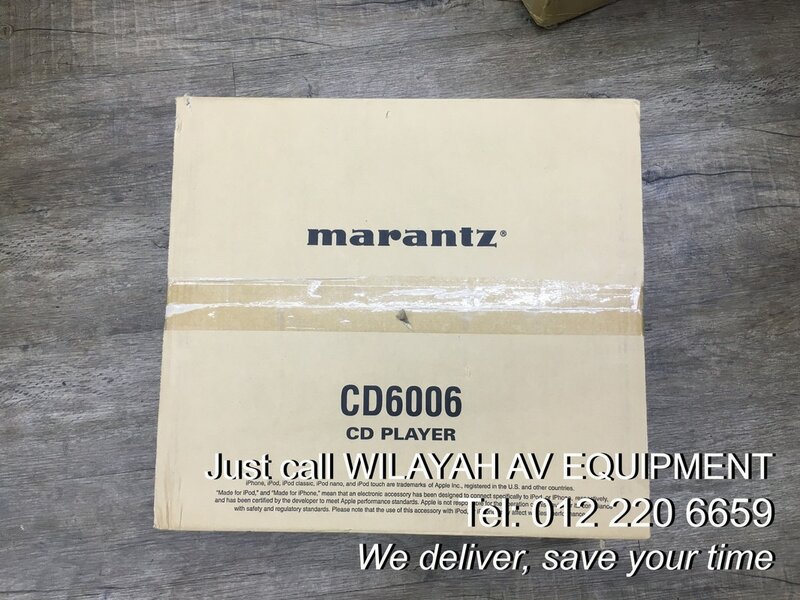 Marantz CD6006 delivered to our customer. To make a purchase, call 012 220 6659 for more details. Optoma S312 - 3200 Lumens, 15,000:1 Contrast Ratio, Native SVGA Resolution, 3D Supported, 1x HDMI input, 1x VGA input, 1x VGA Output, 2.5kg. Optoma X313 - 3200 Lumens, 20,000:1 Contrast Ratio, Native WXGA Resolution, 3D Supported, 1x HDMI input, 2x VGA input, 1x VGA Output, 2.5kg.